Looking to get cash for your valuable family heirlooms? Because we travel the world buying fabulous jewelry and watches, we understand the market from a global perspective. Since we market our collection directly to collectors and consumers of fine jewels and watches, there is no middleman, no commissions. So if your lifestyle has changed or you're not wearing your diamonds or other jewelry, or you just want to trade in your old watch for something new, give Gray & Sons the opportunity to pay you the highest price immediately. We are committed to meet or beat all legitimate offers. We insure every piece we take on consignment with Lloyds of London for up to $3.5 million, affording you the best protection available. We will not sell any piece that is not in mint condition, so at our cost we will repair/restore your piece before it goes on sale. Fastest conversion rate in the industry! Our success rate is impressive: over 85% of merchandise is sold within 8-10 weeks. We aggressively market your item by professionally photographing it and placing it in our printed monthly color catalogs, mailed to half a million potential buyers a year. Cost to you for all the services above: $0. All associated costs of selling your item comes out of our pocket. No photo fees, no insurance fees, no shipping fees, no repair fees, and no commission fees. 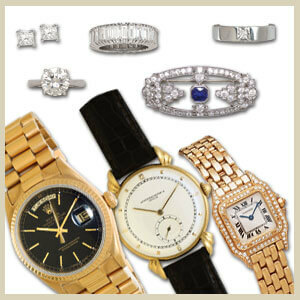 It’s such a good program, other jewelry stores consign items to us.